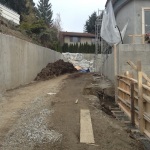 WaterfallNow was recently referred to construct multiple rock water features for this beautiful custom built home in West Vancouver at 1413 Sandhurst Place intersecting at Chartwell Drive in West Vancouver, BC, Canada. Sample Photos During Construction Process. The final product always looks completely different once attention to detail, water, lighting, touch ups, and coloring are added. Completed – new photos to come. 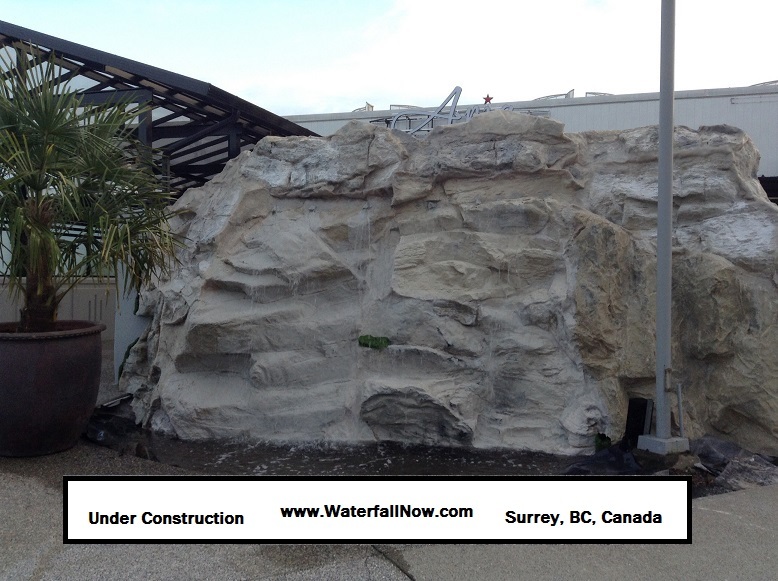 Custom fiberglass rock waterfall feature in Zero Ave, High Point, Langley, BC, Canada. 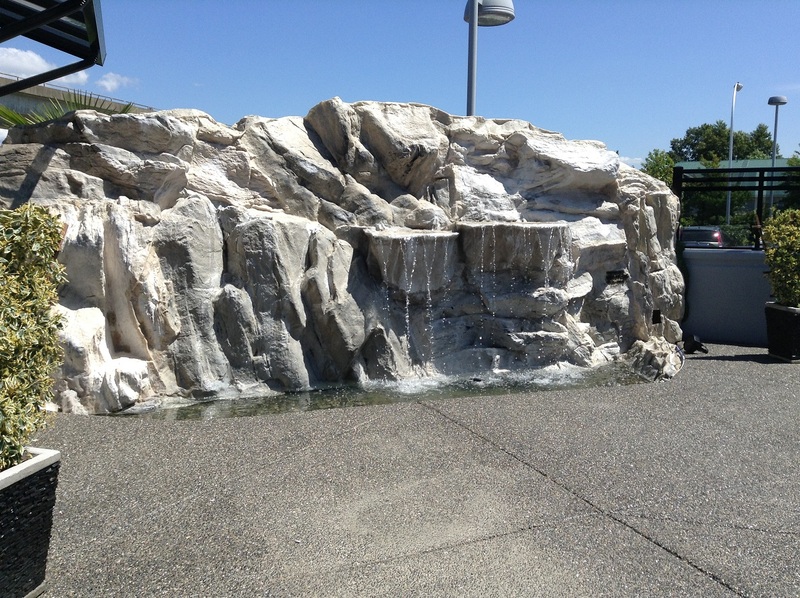 Whether you have a pondless waterfall, koi pond, or outdoor fountain, there are a few important steps to take to winterize any water features that you may have in your backyard. 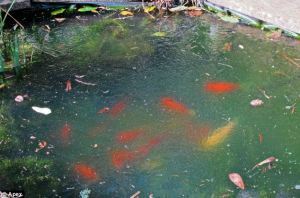 One step to take is to ensure that the pond area is free from debris such as fallen leaves, branches, or dead plants. The presence of these is often the largest contributor to maintenance requirements. Proper placement of a water feature away from potential debris can lead to a maintenance-free waterfall. In other cases, more notably in the fall months, such organic materials will deteriorate in the pond. This lowers the quality of water which can in turn decrease the lifespan of the pond pump. It is recommended to cover the pond water supply using a net or trimming nearby branches. Much like a pool, it is essential to keep the pond free basin free of decomposed organic sludge. If draining of the pond followed by a sweep is not possible, it is recommended to use a pond vacuum. One should not over clean because the fish, frogs, tadpoles, and other organisms will often use the organic sludge at the bottom of the pond to nest in. Another concern if you have fish is that the levels of ammonia, hydrogen sulfite, and nitrates will be increased as a result of the debris. Hydrogen sulfide in particular is poisonous to fish. Also, because fish require oxygen to survive, it is recommended that an open hole is maintained to allow oxygen in and to let carbon dioxide out. 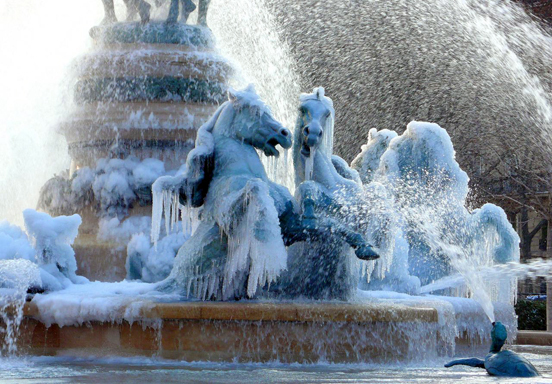 If you find that the water has frozen over, it is recommended to open the hole using boiling water as banging on the ice can irritate the fish. Proper pump care for a pondless waterfall is necessary in harsh climates that are well below freezing temperatures during the winter months. It is recommended that you disconnect the pump, drain, and store in a dry place. It is also recommended that the waterfall be drained and covered to protect the internal hose/plumbing systems. If you have fish, it is recommended to try and leave some form of aeration system on for the pond to provide a fresh supply of oxygen to the pond. If the weather is too cold then a regular aquarium air pump will do in a pinch (even if the water is freezing). Floating pond heaters are available in stores and serve the purpose of keeping the pond surface from freezing over. Pond owners will find that the deeper and larger the pond, the less maintenance is required in the long-run as a natural ecosystem builds up over-time. Smaller ponds that are shallow tend to require more careful attention. this is especially true in the winter as they can freeze over killing the fish inside. Fish often stay near the deepest areas of a pond during the winter months. WaterfallNow’s waterfalls on the other hand can run year-round as Vancouver’s temperature is not as harsh. Because water rarely freezes in the Lower Mainland, BC, we are able to operate almost all of our waterfalls in any season without any issues. 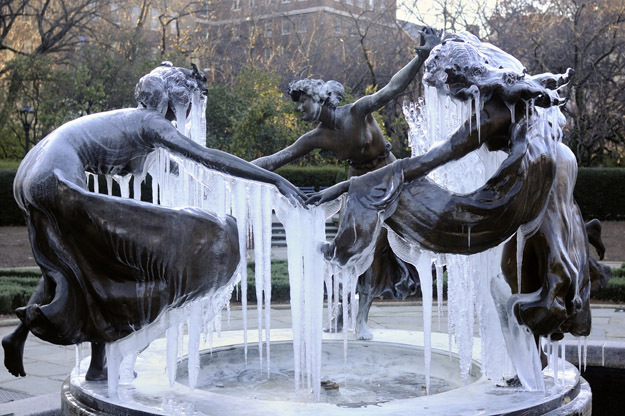 The fiberglass kevlar backed membrane can withstand even harsh freezing temperatures without fear of cracking that could cause significant damage to the structure or worse – leaks. 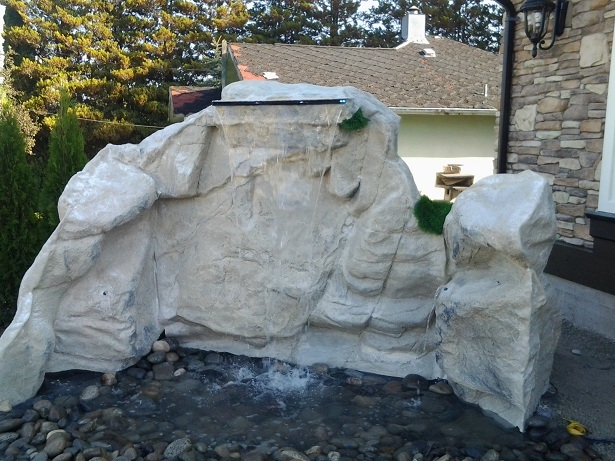 Custom waterfalls made with lightweight fiberglass provides infinite possibilities to get a completely custom-crafted waterfall for the home and garden. 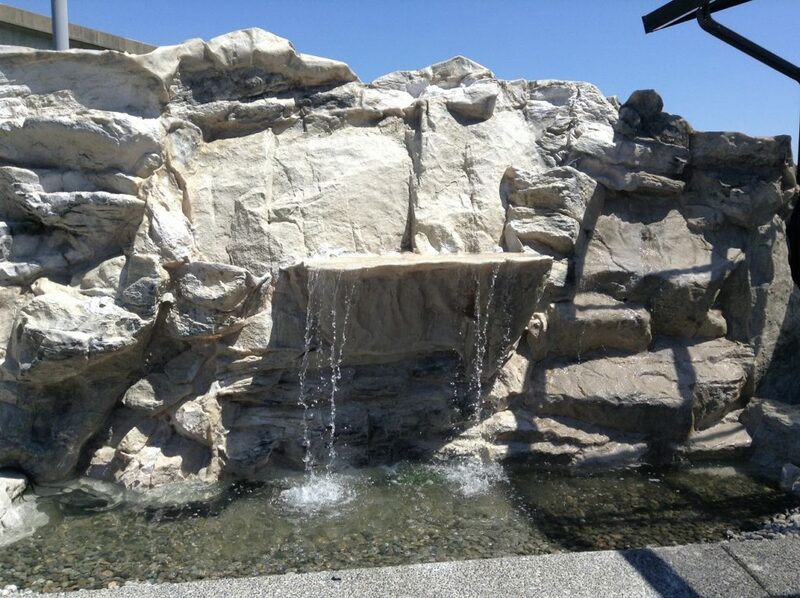 The versatility of artificial rocks (also referred to as faux, fake, or imitation rocks) allows landscape contractors to create beautiful waterfalls for their clients. 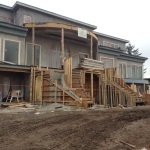 Typically these contractors serve a very niche market comprised of wealthy home owners. There is very little that compares to having a miniature resort in your own backyard. People have a tendency to be drawn to waterfalls. 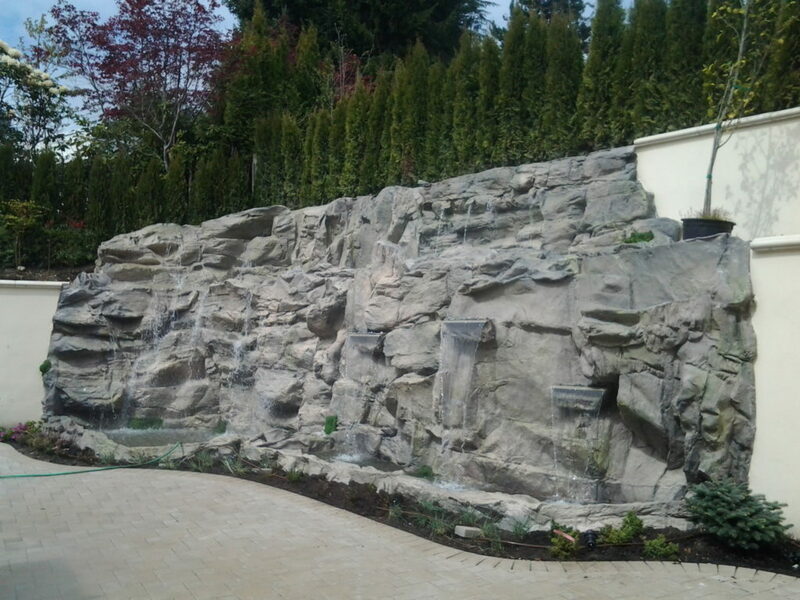 Rock waterfall contractors simply recreate that effect for you from the comfort of your home. 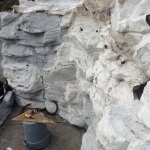 Faux rocks can come in virtually any colour by using different natural rock powders. Their colour can even be changed using paint year after year. Change from one color to another with ease. Paint spray guns work well for this and the mixture of several different colors is recommended. Normally the biggest barrier that we find our customers face is that they don’t have the budget for something spectacular. The industry average cost for custom crafted work all things considered can be $400+ per square foot. We often have deals going on where we do it for less than half of that. The competition is essentially those miniature fountain statues that you buy off Ebay. However, some people want something much larger that fits well in their yard. Excalibur Bowling has closed down because they did not wish to renew their lease. 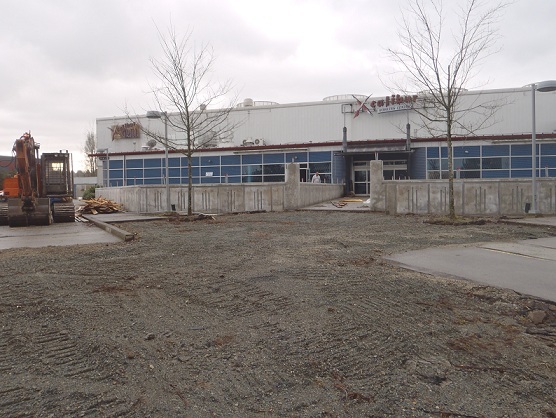 So the largest banquet hall and convention centre in Surrey, Canada is going there instead. 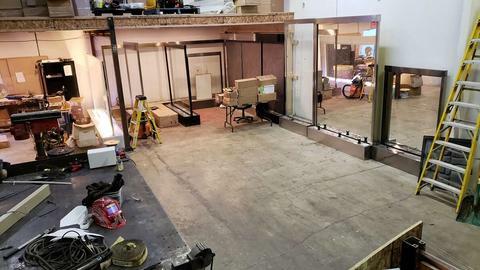 It is expected to open by the end of April. 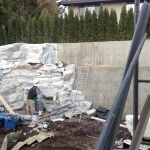 We are building a rock wall for a section on the inside of the building as well as a rock pillar. 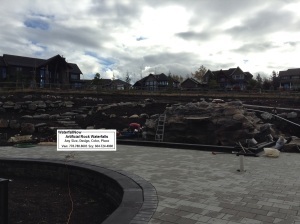 Building of the two rock water feature fountains on the outside have commenced. 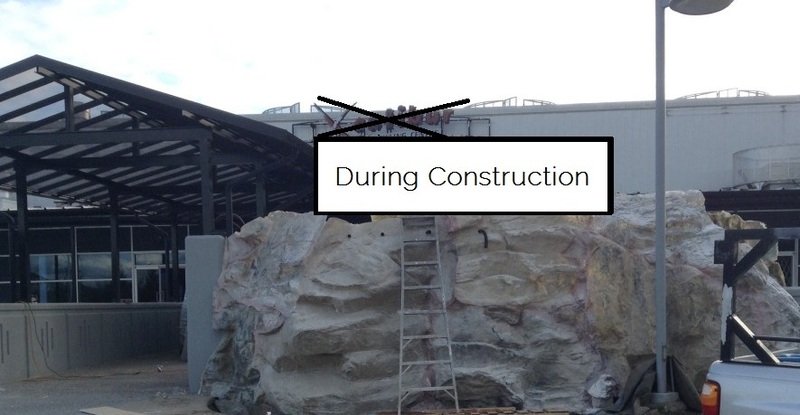 Once the rocks are completely assembled, pumps are installed, and lighting is added, it will look very different from the photos below. New photos and videos will be added shortly thereafter. 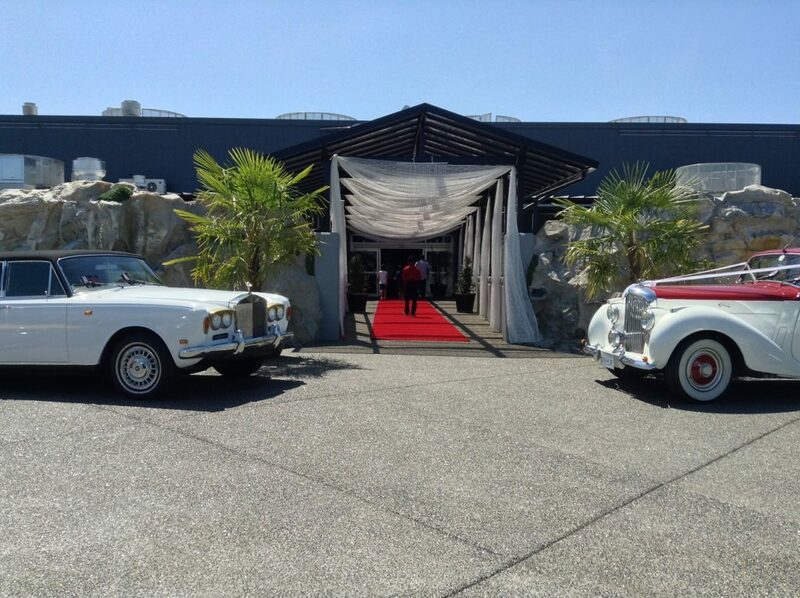 Feel free to add the banquet hall on Facebook. Waterfalls and water features are a booming trend! Water feature on left side. These are double-sided and water will be spilling down from different spots with colourful lighting. Will post updates of the finished project. Water feature on the right side (bottom). Like the one above this is also double-sided. 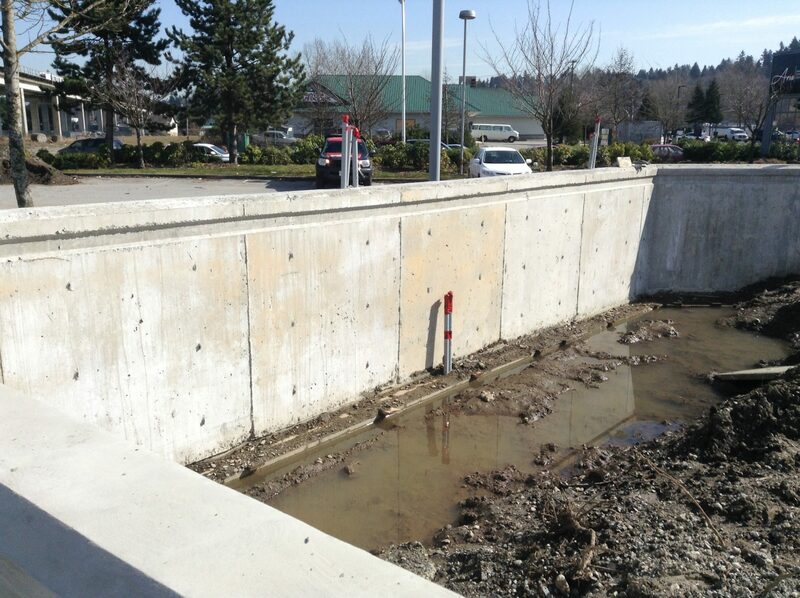 We will post more photos of this commercial rock water fountain project when completed. Minor touch ups, additional lighting, gravel to be completed soon. The crew at WaterfallNow simply loves doing what they do and are thankful for the opportunities to work on a number of different projects. 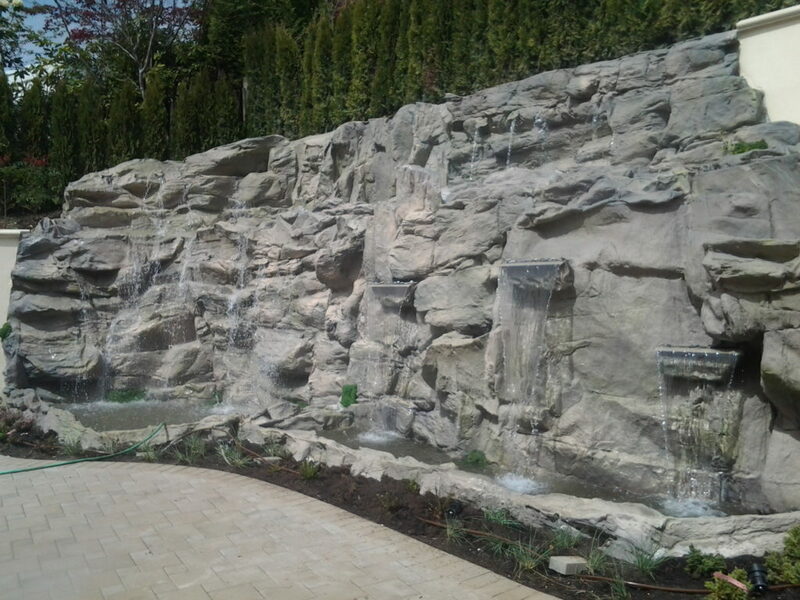 WaterfallNow has been able to help many clients in the Lower Mainland relax with a staycation at their own home while listening to the soothing sounds of cascading water. Starting something new is always daunting. Stepping into a small niche industry already dominated by larger companies was even more daunting. 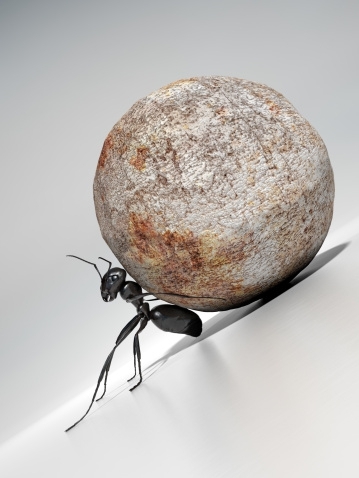 But in the end, persistency always seems to have a way of paying off. Perhaps the only reason we decided that this would be a good idea was because of the support of our customers. We would be nowhere had we not received that support. Why consider having water features? Because they are awesome! If money or space was no object most people would be open to having one. There are many companies that create beautiful water features as a quick browse on YouTube should show. One such company is Aquascape. 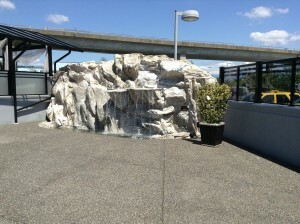 They create water features using natural stone. There are several methods of creating water features that range in price from very inexpensive to very expensive. Keep in mind however that it isn’t always the case that you get what you pay for. So why consider water features as part of the bigger picture of landscaping overall? “Nearly 20% of buyers say they consider landscaping to be a ‘very important’ factor in their decision to buy a house, according to a new study by the National Association of Realtors.” Wall Street Journal. Selling Houses by the Yard. August 17, 2007. OK. 20% isn’t a big number but when the group was narrowed down to higher end homes that number increased significantly. After all, a luxury home just doesn’t feel the same without stunning landscaping work. “Property adjacent to water – whether a pond, lake, stream, river, or ocean – is often more expensive.” Kaplan, Kaplan, and Ryan. With People in Mind: Design and Management of Everyday Nature, p. 113. Adding some water features to the yard tends to increase property value provided that it looks good. It can also be a no-no when done in areas where there are only a few warm months. Fewer buyers want to deal with maintenance. Speaking of maintenance it is a good idea to install lawn sprinklers. For high end homes however, adding a pool may be advisable. By digging a hole, laying some pond liner, throwing on some rocks, a pump, and some arranging you can create an inexpensive water feature. The downside to this method is of course the maintenance. It doesn’t take long for this method to start resembling green pea soup. Water features in the backyard of a home are often enjoyed during the Spring and Summer months. Weekend gatherings and BBQ’s on the patio can be more enjoyable when spent nearby a water feature. The sound of trickling water is soothing and reduces stress. This is good news as stress can trigger or act as a catalyst for many health related issues. “… Hospital patients who have a view of natural landscapes recover faster from surgery and require less pain medication. In addition, heart rate, blood pressure, and other measures return to normal levels more quickly when people view natural rather than urban landscapes after a stressful experience.” The Sustainable Sites Initiative. Standards & Guidelines: Preliminary Report. November 1, 2007. Similarly, those who have an aquarium with live fish in their homes may also experience these benefits. Maybe you have a blank slate, that is you’ve just bought some land and are drawing out plans for what it should look like. Do you prefer having a large lawn or do you prefer having a pond? One of the major things to consider is the maintenance of a pond and whether or not you are willing to keep it in good shape. Unkempt ponds are unattractive, and are a breeding ground for many insects including mosquitoes. That is not to say however that homes should opt to go without a water feature altogether. Not all water features require a pond. Homes with smaller yards often opt for pondless or invisible waterfalls. It is known by many that having water features improves a property’s value (as would a gazebo, patio, or a sundeck). But did you know that it is rated as one of the best ways to improve the appearance of your home? Not too many things in a yard can stand out quite like a professionally crafted water feature. 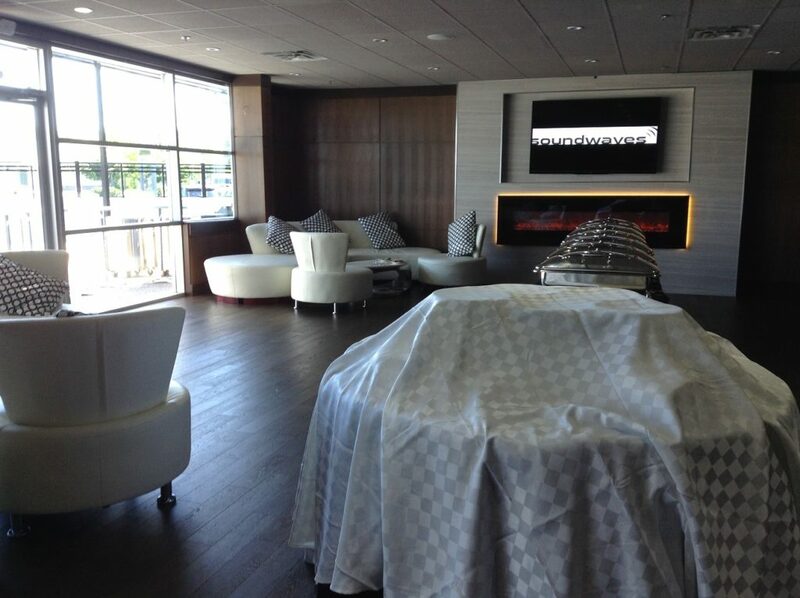 Our Custom Water features have a way of naturally drawing people towards them. Having a waterfall is a great way to showcase your home and make it stand out from the rest. Too many homes are being built using the same cookie cutter format all throughout major areas. It is nice to add a fresh landscaping concept to the mix from time to time. 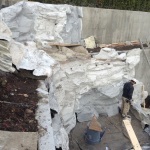 Adding a water feature to an existing pool is considered going all out in most cases. It is easy to decide on whose yard people will hold their party at when there is someone with a pool with water features. There are too few people fortunate to live near an ocean, lake, or other body of water. This leaves many with a basic yard perhaps with some grass, a shed, and a patio table. It doesn’t have to be like that and you don’t need to try and create your own water feature. There are many professional landscaping companies that specialize in these types of projects. The cheapest method of building water features involves just a few hundred dollars but lots of your time. This is the method most people are familiar with and that is to do it yourself (DIY). This can however backfire if the end result is far from desired and you find yourself burying it instead. On the bright side you will have at least gained some of the health benefits of a water feature through the exercise. Hmm… Perhaps even cheaper than the first method depending on how you value your time, simply going to the local Walmart or pond/landscaping/fountain store and buying a pre-made kit may also do the trick. There are some companies that offer either pre-made kits or pre-made fiberglass fountain statues – but you want something much bigger right? A more costly method is to actually hire someone else who is going to create it for you. Make sure this person has experience and the photos on their website are of their own projects. It isn’t uncommon to hire someone new only to find that they are biting off more than they can chew. A professional landscaping company that specializes in water features will either use natural stone or use specially mixed concrete. 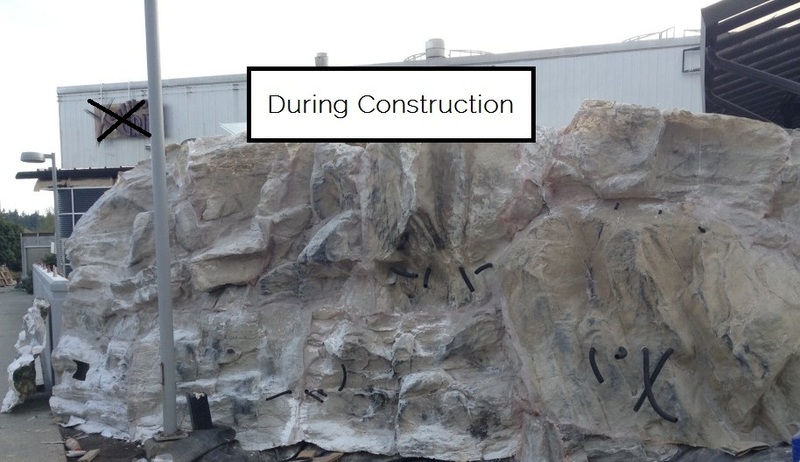 Some companies use fibreglass rock panels that look like real rock and then patch them together. 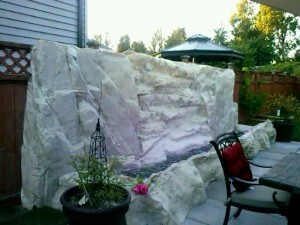 Overall, people will know what you spent on your water feature. One point that quickly comes to mind is conservation. 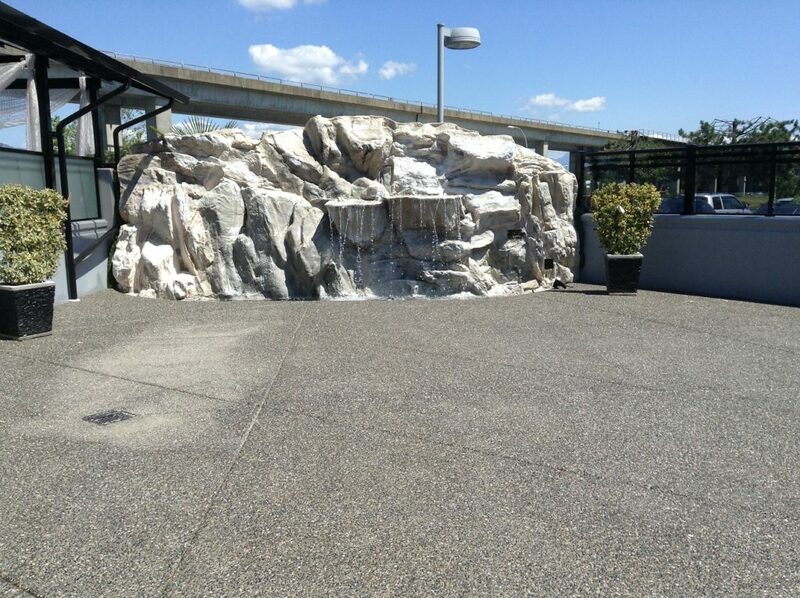 One of the benefits of having pondless water features is the minimal reliance on water consumption. 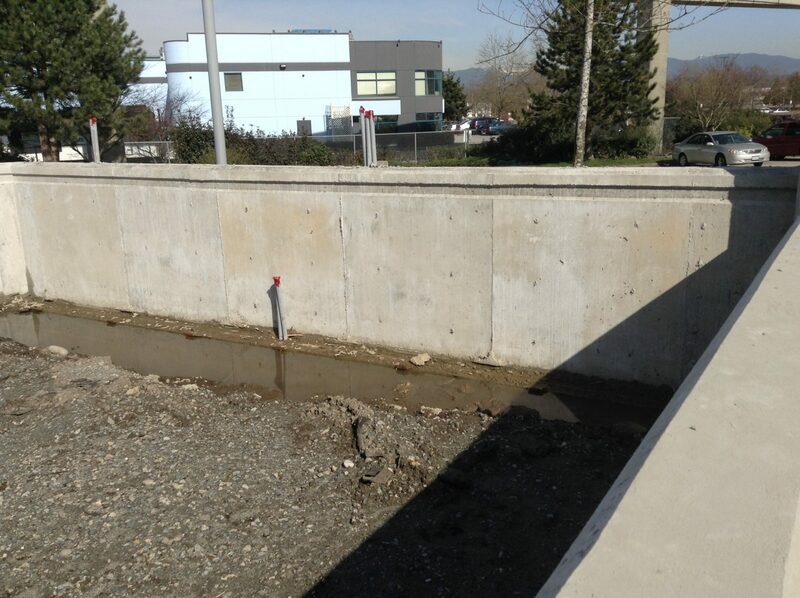 Pondless water features have contained basins where the same water gets cycled over and over. Most people know that the look and sound of water features reduces blood pressure. But did you know that the reduced lower hydro bill can also keep your blood pressure levels in check? Whether you like water features for your yard or indoors you have a wide range of options. The best time to invest in one is now (sooner rather than later). The longer you have one, the more enjoyment and benefit you can extract from the overall value. Try calling on some of the companies that specialize in water features in your local area to inquire about some of the options available. For the DIYer you may be able to get some free advice on where to purchase supplies at reasonable prices. For the person that just wants the best and wants it now it is still a good idea to ask around to see what is available. What might be considered the ‘best’ to one may be completely opposite from another. 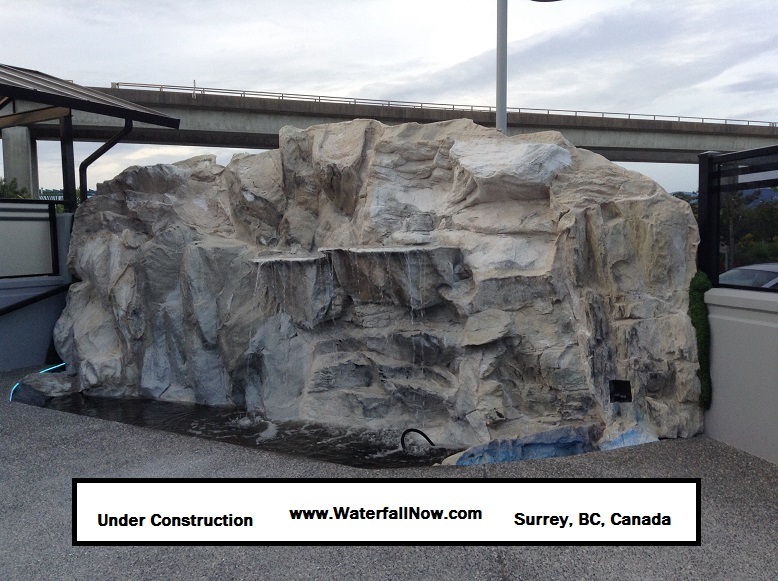 WaterfallNow is experienced in creating all kinds of custom pool waterfalls. What was once a 2 man landscaping operation eventually saw a long transition to a niche market in custom waterfalls. 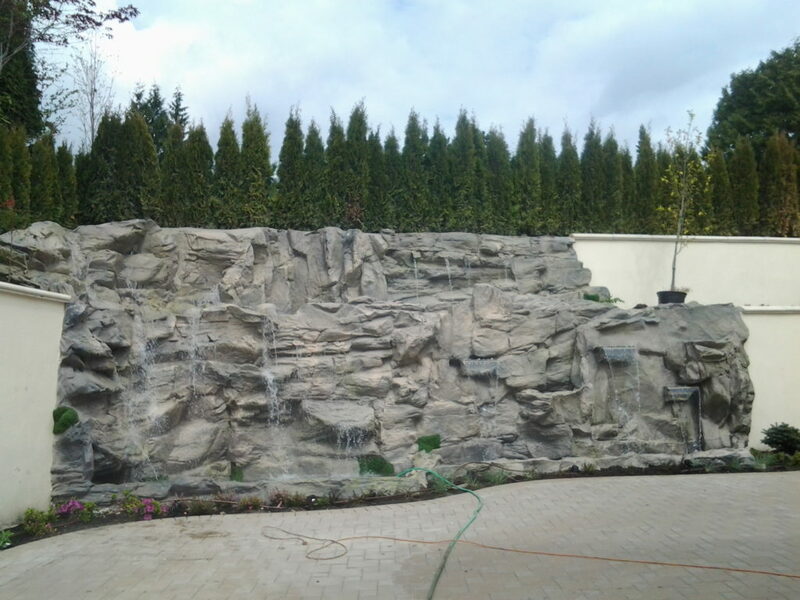 The team grew a passion for creating man-made artificial rock water features and waterfalls for people throughout the Lower Mainland, BC. Through many years of trial and error WaterfallNow finally settled on a technique that clients could afford, looked realistic, lasts indefinitely with no fear of cracking or maintenance, and was highly desired. 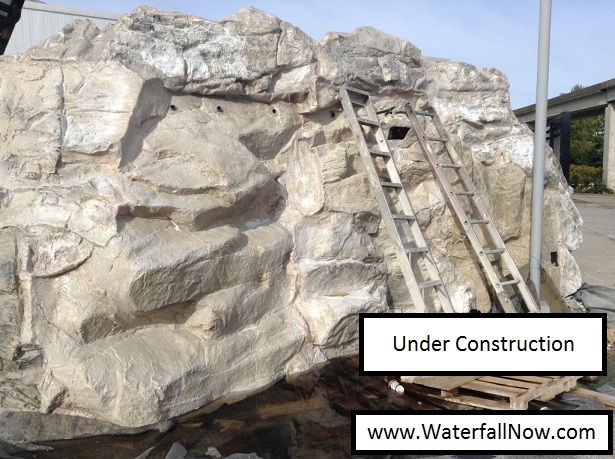 WaterfallNow has created luxurious pool waterfalls for rock bottom prices while just starting out in the business. That learning process is something that ultimately benefits our new clients (friends). Though the market was not as big as what was once very busy as commercial landscapers it has been picking up in pace. One of the things that we noticed was the importance of timing. Over a decade ago for example, the WaterfallNow team sold artificial turf and “Viking Ice” (you can’t win them all). The artificial turf business was not big at the time but fast forward to NOW, nearly every landscaping company today is utilizing artificial grass in one way or another. Moral of this story was that we should have remained focused no matter what was going on to the left or right. Almost a last ditch effort, WaterfallNow decided to stick with the custom waterfalls idea no matter how crazy it seemed. 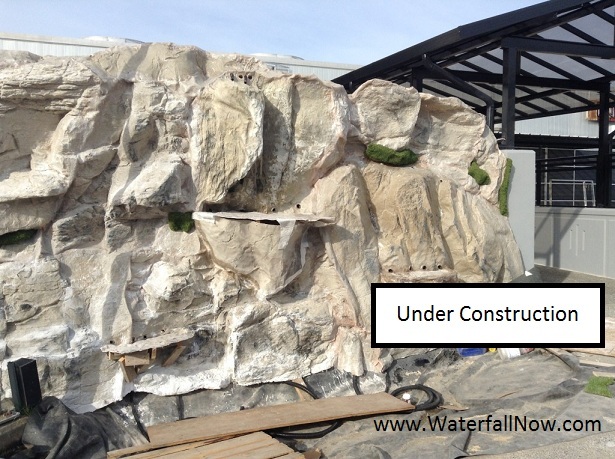 We knew that over time, the trend would eventually catch on and more people would be envisioning having one of WaterfallNow’s rock features for their home. 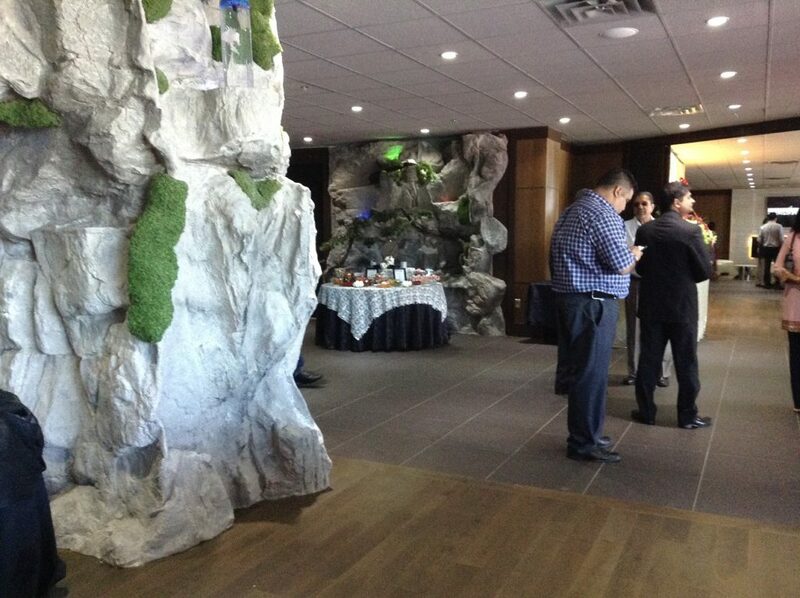 Our goal was to provide rock bottom prices for these luxury resort theme rock walls and pool waterfalls. Did we achieve that goal? Far from it… However, WaterfallNow has decided to make a big change this year. One major mistake that we made in the past was not owning the domain name of our business (it used to be under rockywaterfall.com). The person who owned the domain vanished to Australia without any contact. Losing the website along with all the files on it was tough for us. WaterfallNow was once burnt out and unable to handle all of the demands. Following the loss of the website, business had slowed down to a grind. Things such as school and other ventures eventually got in the way and there was no focus. Some things happened in 2014 and the team (WaterfallNow) decided to get back into the game. One of the motivations was to be in a position to offer a service that others aren’t willing to offer – for a multitude of reasons. 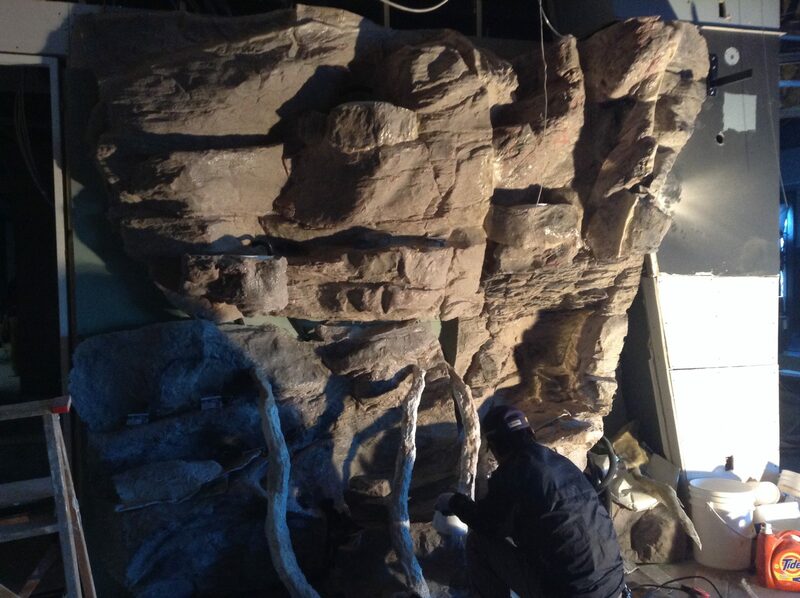 The team did not attend any trades school or take any courses to take to learn and develop a unique method of creating the rock features. Everything learned was ‘acquired’ over many years of trial-and-error along with a major investment of time and money. If WaterfallNow wasn’t going to do it, nobody else would. By now we understand how to harness the power of focus in business. WaterfallNow has a new line of rock designs and styles. Our rocks are hand-made using a blend of natural and synthetic materials. We employ fiberglass because it holds the shape of realistic rock faces (the cracks, grooves, dips) much better than anything else on the market. Plastic did not look real concrete cracked and required a lot of manpower. Concrete is undoubtedly one of the best ways to create large water features but the cost is an issue for most home-owners. 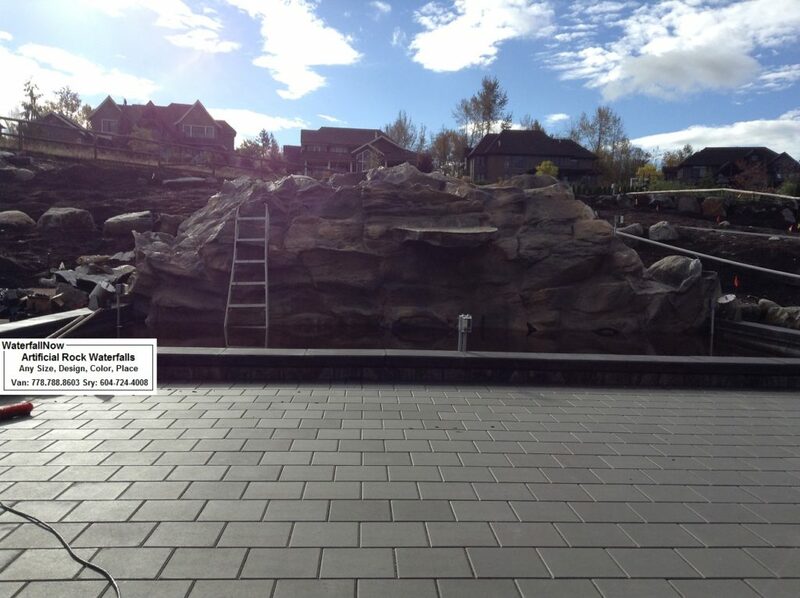 WaterfallNow helps owners of luxury homes that are either built, or in the process of being built, probably the best way to get a truly custom designed rock waterfall or water feature for their backyard, frontyard, or pond, or pool. 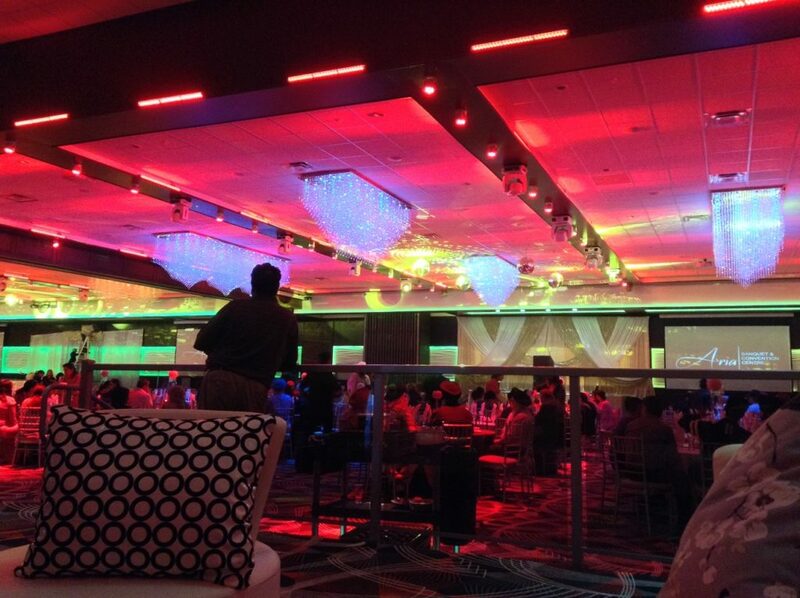 The endless custom options including lighting is what differentiates WaterfallNow from everything else. We create beautiful waterfalls for pools that for the same dollar for dollar amount elsewhere would never be possible. We once took a look at indoor water walls or water wall fountains and were amazed that they could average between $4000 – $10,000 online. The wall-mounted water walls are undoubtedly a great fit for indoor locations but the dollar amount is a barrier for most consumers. WaterfallNow for some crazy reason still maintains a similar price range for something that is truly custom tailored, built on-site, can be made to any shape, or colour, and is much bigger in size. Whether prices increase in the future is left to be determined. WaterfallNow continues to serve current clients with rates that most people can budget for their home. After all, a luxury home (every home) is not complete without a great yard that you get to enjoy for half of the year – for many years. WaterfallNow has created many pool waterfalls for clients under $10,000 that not only look like they cost 5x more but even helped our clients eventually sell their home for more than what they were expecting. The increased property value or even personal attachment of the waterfall to a prospective buyer can be part of the added benefits. We have met many people over the years who now can’t imagine owning a property without the sound of a waterfall. If you are looking for a pool waterfall that is simply for decorative purposes we encourage you to get in touch with WaterfallNow. 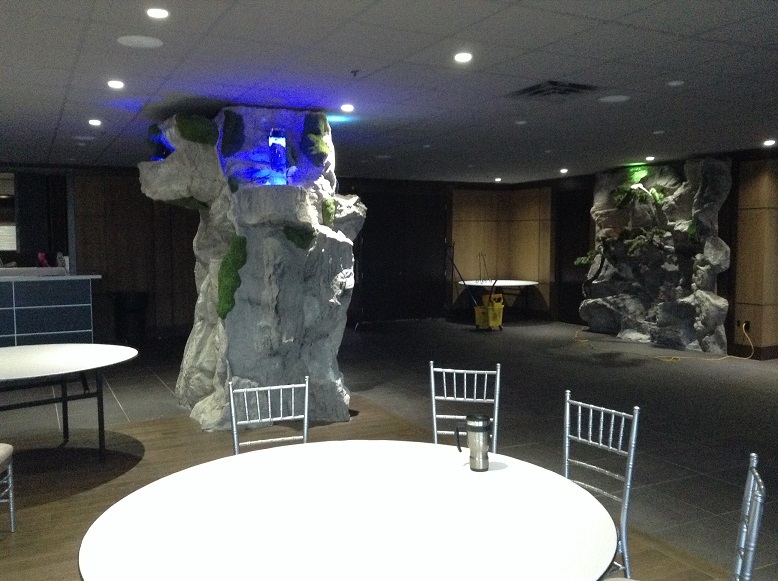 In other news… Here is a photo of an indoor rock feature approximately halfway to completion. Does it look like real rock? 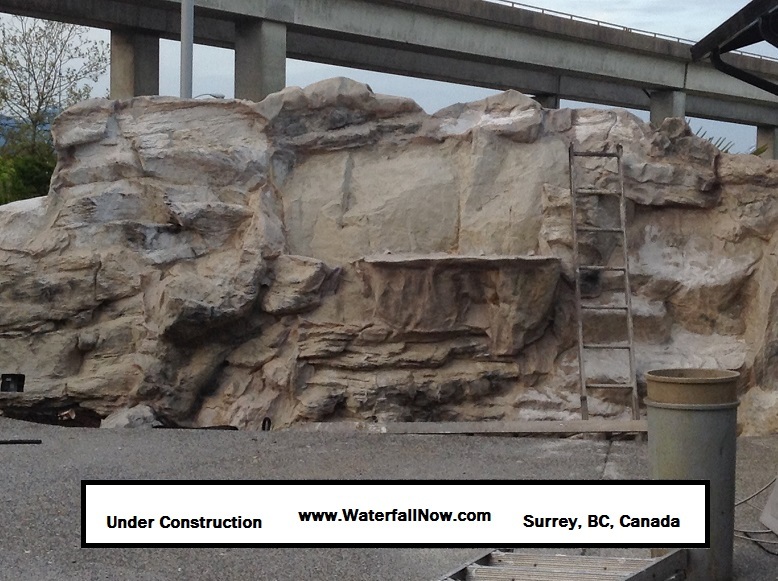 WaterfallNow no longer utilizes rocks purchased online for the purpose of creating fancy waterfalls. 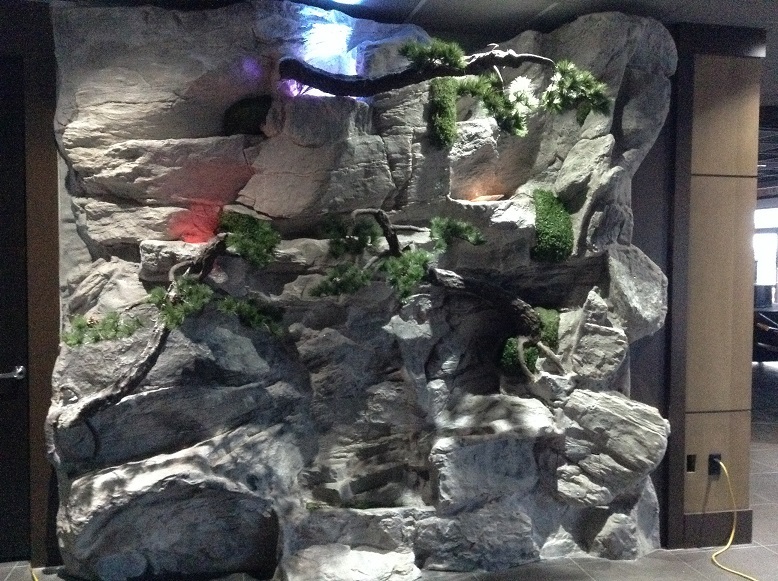 The team now uses its own hand-made rocks to create all custom designer artificial rocks and pool waterfalls. We appreciate any feedback you may have. WaterfallNow also hopes to get back in touch with previous clients under this new domain name. 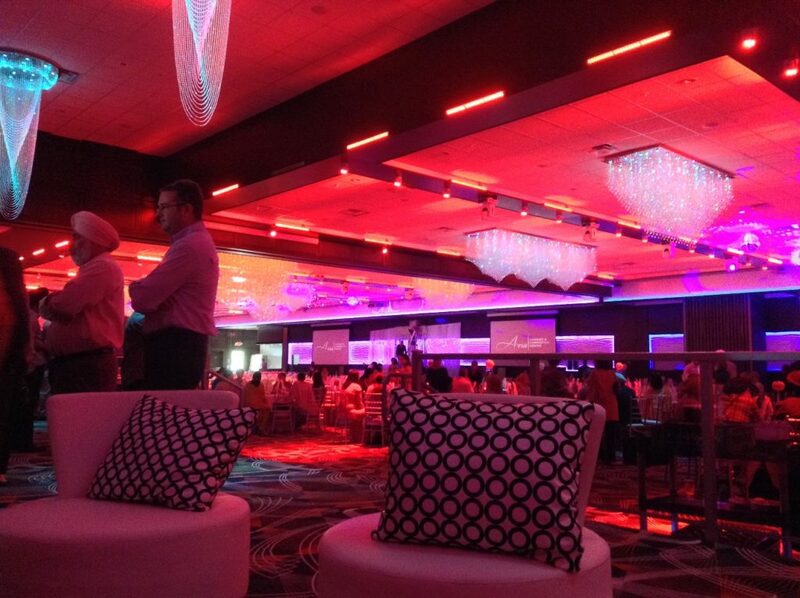 The Honourable Dianne Watts, Mayor Surrey, BC gave it high praise by stating that it is “the best banquet hall – by far” that she has seen in the past 18 years of visiting many different banquet halls throughout the nation. 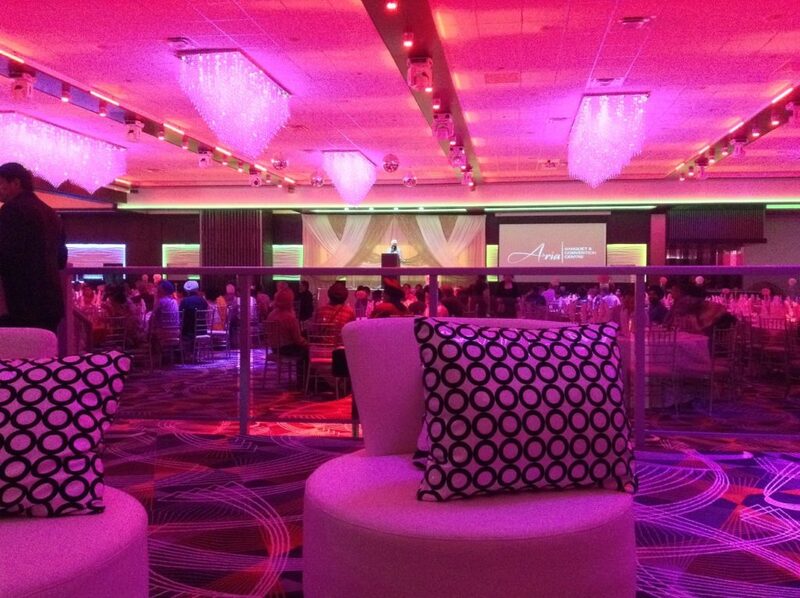 Leave a comment on the Facebook page Aria Banquet And Convention Centre. 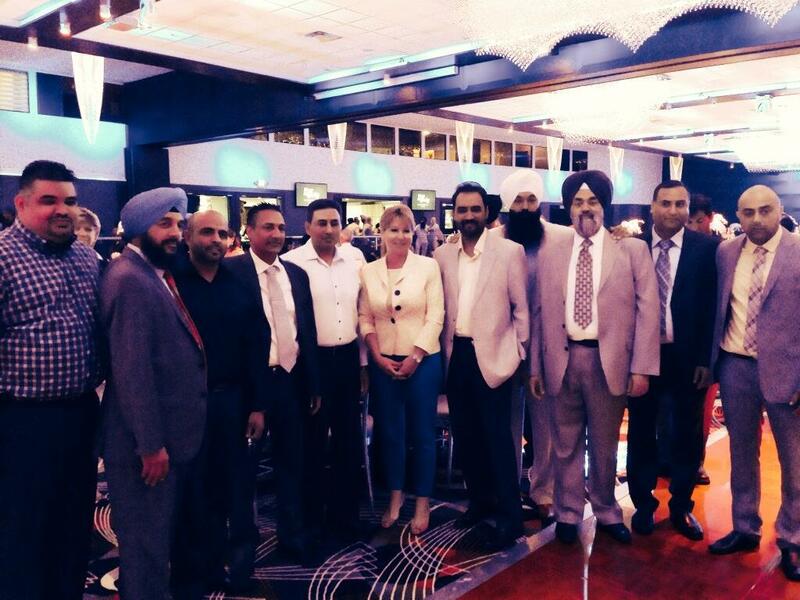 The Honourable Dianne Watts Mayor of Surrey at the grand opening of Aria Banquet and Convention Centre along with the founders of Aria. 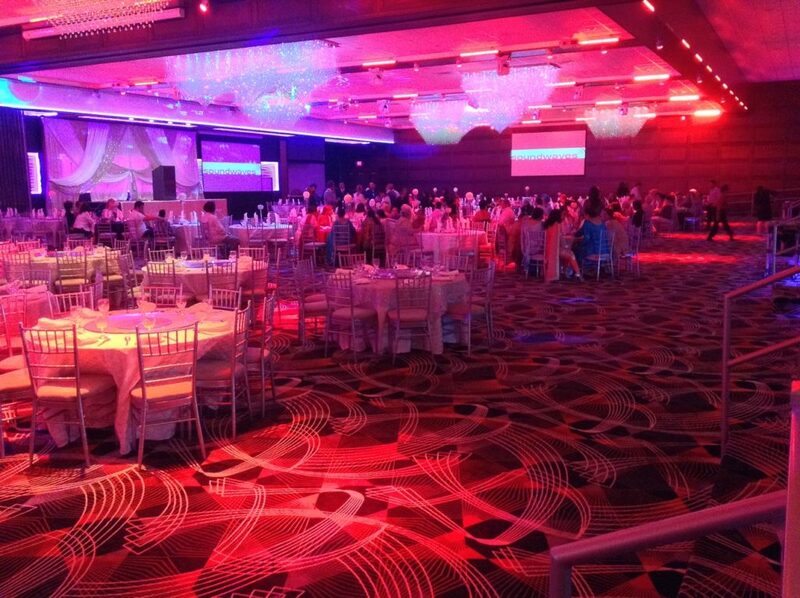 Aria Banquet and Convention Centre – The #1 place to host any corporate or personal venue in Canada. 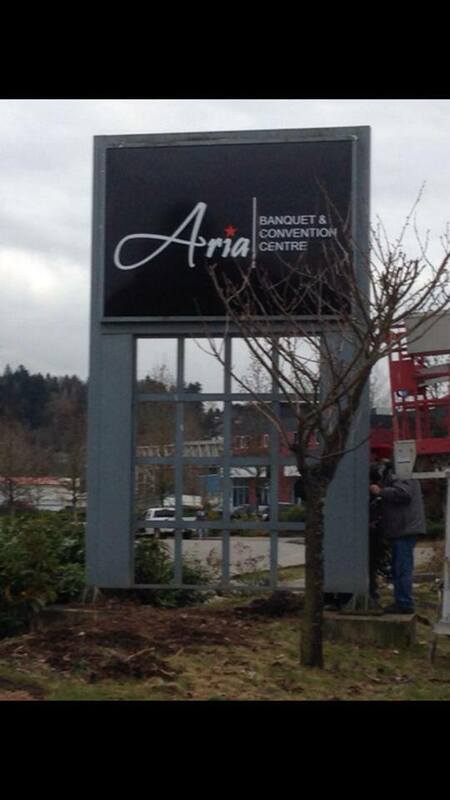 Photos from the grand opening of Aria Banquet and Convention Centre in Surrey Saturday June 21, 2014. The food looked excellent. The staff was well coordinated and professional. A surprisingly decent turnout for a weekend event. Lots of music and opportunities for people in the community to connect. 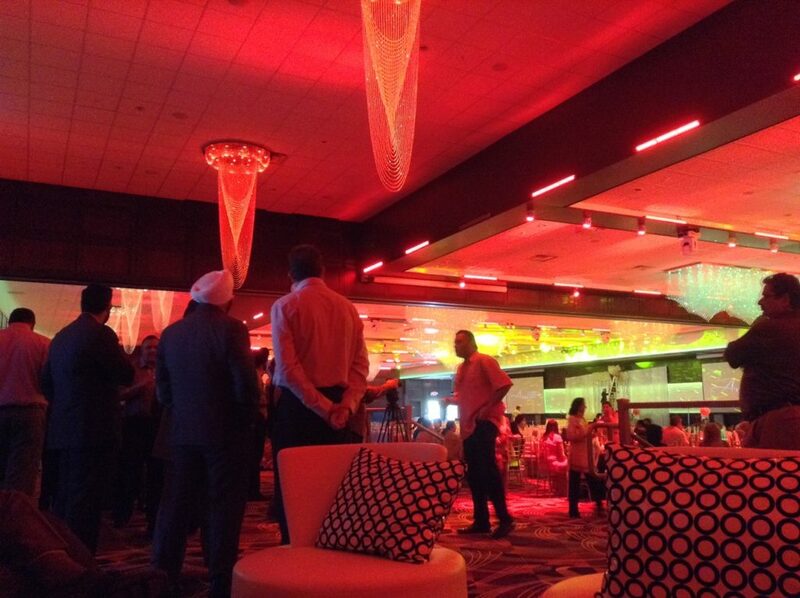 Overall a great experience and a successful grand opening for Aria Banquet and Convention Centre. We truly hope that Aria has the success that the founders, organizers and the community itself deserves. 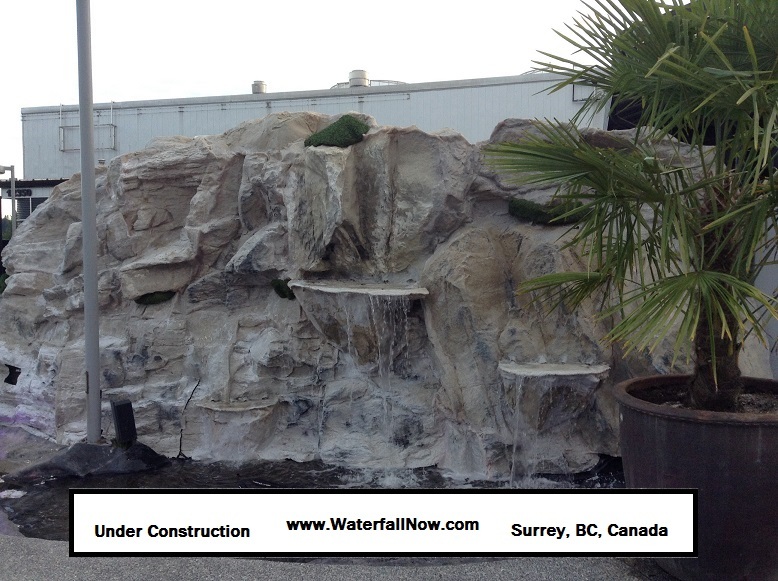 Commercial Waterfalls Surrey BC. 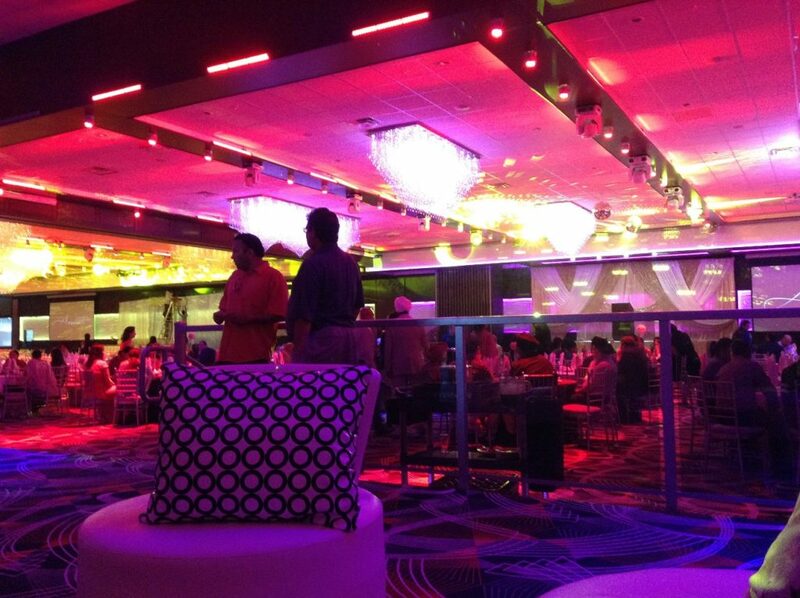 This is what it looked like before Aria came in. Believe it or not, this was the same building that Aria has renovated. Aria now boasts over 500 parking stalls, 60-100 experienced employees at any given time, daily bookings, and many more satisfied visitors who can’t wait to share their experiences. Xcalibur bowling on Scott Road in Surrey is closed. It was a big part of Surrey for many years. Have something you want to say? Visit their Facebook page for more details or to leave a comment. 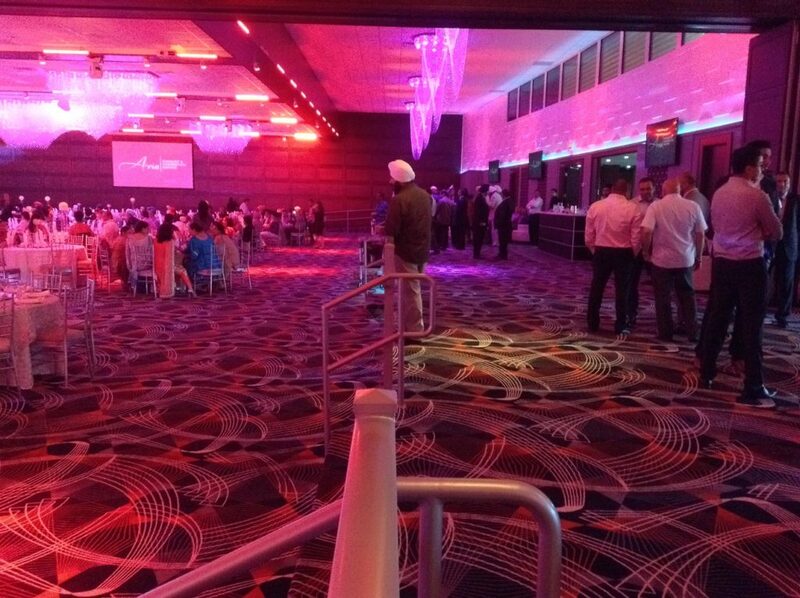 Surrey has its sights set on bigger things and the addition of the banquet hall has helped to ramp up the presence of security. What’s taking its place is the largest banquet & convention centre in Canada.